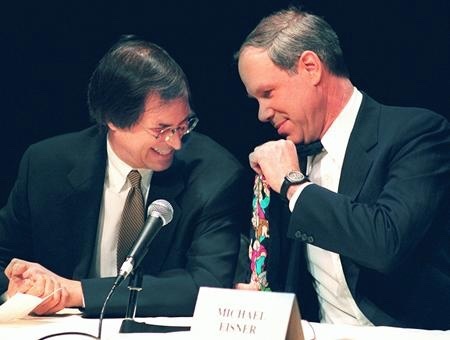 Eisner was CEO of The Walt Disney Company from 1984 to 2005. He saved the company from a certain decline in the mid-1980s. In the making of Toy Story, he was originally supportive (though most of the deal was worked out by Jeffrey Katzenberg). However, when time came to renegotiate Pixar's contracts, he became increasingly opposed to Jobs. He publicly stood out against Apple invoking their "Rip. Mix. Burn" ad campaign in 2002, and didn't renew the Disney-Pixar deal in 2004. This was a key argument in his ousting in 2005, when he was replaced by Bob Iger.